This weekend, I couldn't resist the $35 cost to purchase a Chromecast device. To be honest, I have an Apple TV and a Samsung Smart TV, so I did not really need an additional way to stream audio and video to my television. But what the heck! For $35 dollars it seemed to be worth a try. I brought the device home and began setting it up. The physical setup of the Chromecast hardware is easy enough. You simply plug the power cord into the device, then you plug the device into an HDMI slot on your TV. If you use the HDMI extender provided, you simply plug the Chromecast device into the extender, then the extender into the TV. Then, it is a matter of setting up the device, which involves installing the Chromecast app on your devices, whether a Laptop or an iPad. I won't get into the mechanics of this entire setup at this point, but suffice it to say, it is a fairly simple process. But the question most would ask, "Why would I get a Chromecast? Here's some reasons to consider. It is relatively easy to install and set up. I don't feel it was as easy to set up as my Apple TV, but getting the device working is not difficult for anyone who has set up a Blueray player or any other device on their TV. It is an inexpensive (only $35) way to give yourself the ability to stream video and audio to your television. It appears that the apps that allow streaming through the device are limited at this time, but it is another option to get Netflix on the other televisions in your house without paying the 89 to 100 dollars for more expensive devices. Picture and sound quality of Netflix is excellent. I had no problems with picture of sound quality when I streamed Netflix and Pandora. Right now, there are only drawbacks I see with the device. One is you can't stream your iPad device content directly to the Chromecast device like you can with the Apple TV. You also apparently can only stream from inside your Chrome web browser from the PC. 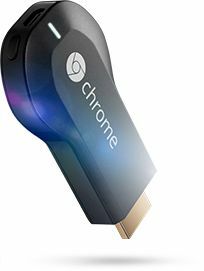 But, then again, if you only goal is to get apps like Netflix or Pandora to another TV in your household or classroom, then Chromecast is an inexpensive option. The second drawback is when you do stream from inside a Chrome Web Browser tab it is painfully slow, in spite of trying to tweak settings according to the help settings. Was it worth the $35 spent for the device? I would at this time say, "Yes." Chromecast is obviously a work in progress. I could see it as an inexpensive option for those wanting to access selected apps from their mobile devices with a television. I want to try it on an LCD projector, but I am afraid that will have to wait until Tuesday when I return to school. It might prove to at least be a cheaper option to get streaming video and audio in front of classes.